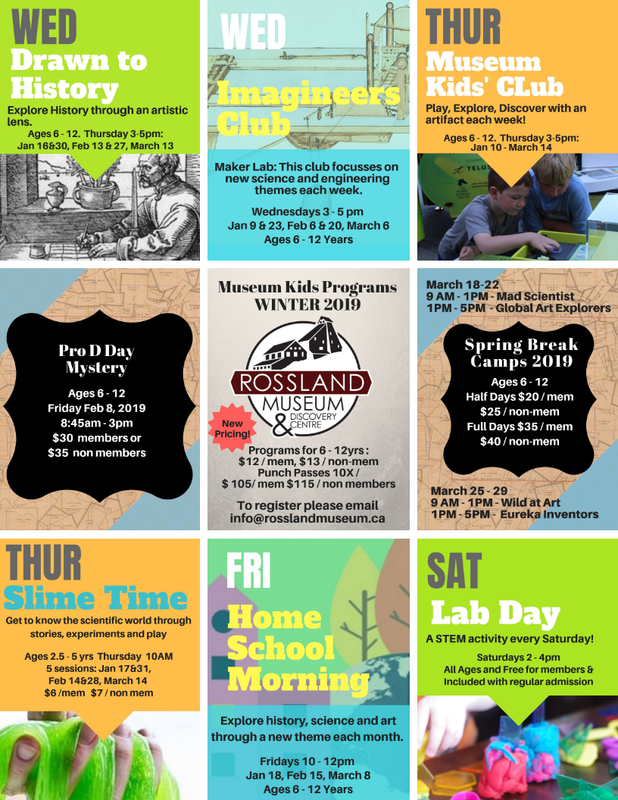 MUSEUM KIDS’ PROGRAMMING WINTER 2019. We have some exciting new programs this winter. Read on to learn about our new STEM Saturdays and our other kids programs. Feb 14 - Valentine's Slime! Sizzling Hearts, Dancing Hearts, Inflating magic hearts, cupids toothpaste, Love - Ah Lamps! Feb 28 - Magnetic earth: Magnet wand sorting, pipe cleaner races, magnetic bell painting, magnetic slime, magnetic ground hog maze. COST: $6 /Members or $7 / Non-Members. Our toddler aged science program will be back after the holidays. Get to know our scientific world through stories, experiments and play! MUSEUM KIDS' CLUB: Every Thursday from 3-5pm. The bus from RSS stops at the Museum. Play, Explore and Discover History through an artifact a week! Jan 17 - Rossland Ski Club Badge collection, Building a popscicle stick ski cabin. Feb 7 - Winter time folk are crafts! We will get a special tour of our collection of art in the collections room. DRAWN TO HISTORY: Every 2nd Wednesday from 3-5pm. 5 dates: Jan 16 & 30, Feb 13 & 27, & March 13. The bus from RSS stops at the Museum. Looking for a regular Thursday activity? Pair this one with Imagineering Club! Explore History through an Artistic Lens! This year the theme for Drawn to History Club is Tell me a story! IMAGINEERING CLUB: Every 2nd Wednesday from 3-5pm. Jan 23, Feb 6 &20,March 6. The bus from RSS stops at the Museum. Looking for a regular Wednesday activity? Pair this one with Drawn to History! Imagineering club is a Maker Lab: This session our theme is "Creative Space"
March 6 - Do you have a precious object? Let's turn it into a mini-museum exhibit! HOME SCHOOL MORNING: We're back on Fridays! One Friday morning each month from 10-12pm. Jan 18, Feb 15, & March 8 Explore History, Science and Art through a new theme each month. Feb 15 - Vintage Valentines! Look through a collection of anitque Valentines Cards and make a Fimo photo Display to take home and use! March 8 - St. Patricks Day is coming up so let's talk about Immigration and geneology! Tour of the archives and learn how research requests work and make your own family tree! LAB DAYS: This winter come to the apres ski LAB DAY at the Museum. A new Stem Activity every Saturday. PRO D DAY MYSTERY Feb 8 (RSS). 9am - 3pm (drop off starts at 8:45) We need the help of a special group of detectives to solve the case! $30 / members $35 / non-members. 9AM-1PM Mad Scientis! This morning program will, conduct experiments and play games based on a new theme each day! Magnetism, Deep Cold, Let it Glow! !, Dinosaurs and Fossils, Extreme Weather. 1PM - 5PM Global Art Explorers! Travel through time and explore art through the eyes of some of the worlds' most celebrated artists! Each day we'll look at the art of a different artist and make work inspired by their materials and media! Mask making, Painting, Print making, Collage and Sculpture. 9AM - 1PM Wild at Art. This camp will be exploring our natural environment through art! Sketching, painting, and clay! If the trails are open we will be outside exploring and sketching! 1PM - 5PM Eureka Inventor's Camp. Each day we will look at a different historical invention for inspiration! This maker lab is for kids that like to be hands-on and constructing out of different materials.